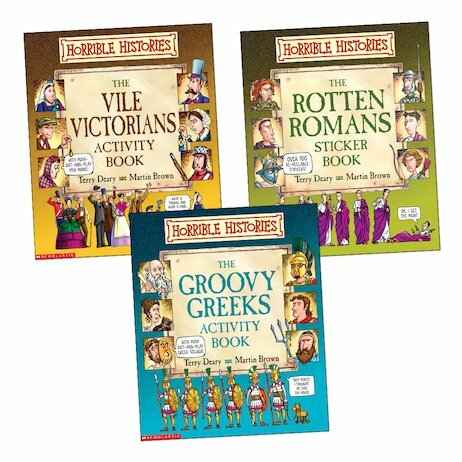 From the sickening series that no intrepid history-explorer can resist, a pack of killer quizzes, gruesome games and stomach-churning stickers! 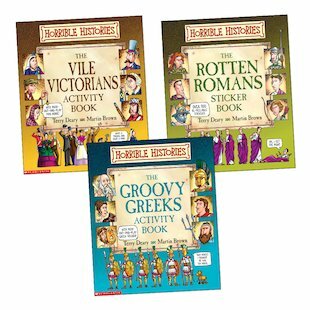 Containing two agonising activity books and one sickening sticker book – as well as lots of vile Victorians, rotten Romans and gruesome Greeks – this pack guarantees frightful fun. So let rip with our horrid historical friends, and join them for all sorts of unpleasant entertainment. Stage grim gladiator games! Slay mythical monsters in Ancient Greece! Take part in some toga-twisting Olympics! Visit vile Victorian factories! Where does it get more horrible than this? Pack includes two activity books with press-out pieces and a sticker book with over 150 stickers. this pack is really good and disgusting ! i think eveyone should enjoy it even my brother !